In may 2000, 4 samples were collected during a pit tour at the Agrium mine. The mine produces phosphate from a carbonatite. Two of the samples were of magnetite, one of haematite/goethite (non magnetic) and one of calcite. 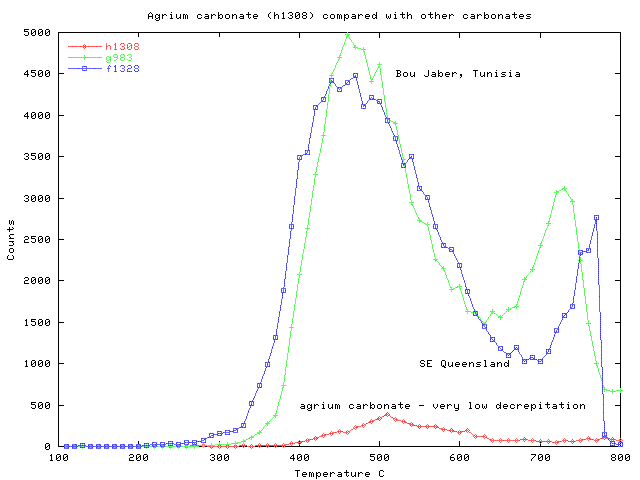 These were analysed for fluid inclusion decrepitation on Burlinson Geochemical model 105 decrepitometer. The 2 magnetite samples (h1310 and h1311) gave intense decrepitation with a main peak at about 550 C. This intensity of response is typical for hydrothermal origin type magnetites. Note that Banded Iron Formation magnetites typically give no decrepitation response at all. The calcite sample, h1308, gave a distinct peak, but it is unusual for calcite to show such low intensity decrepitation. 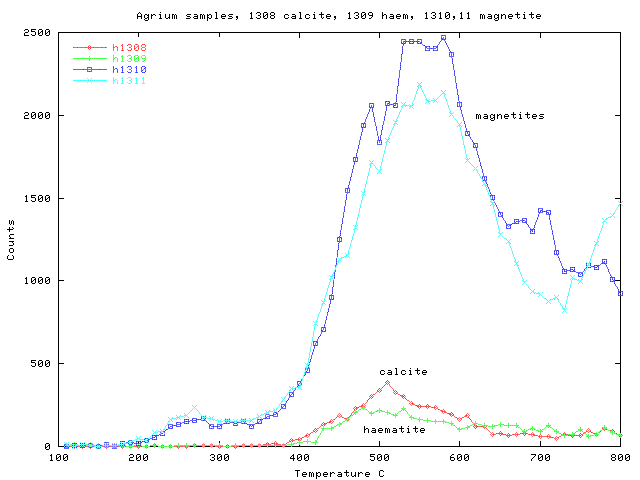 The magnetite results are compared with magnetite samples from elsewhere in the following plot. Upper Beaver and Warrego are both gold in magnetite deposits, and these show intense decrepitation which is at a distinctly higher temperature than at agrium. Lower temperature decrepitation does occur at both these deposits, but peaks as low as 550 C are uncommon. Note also that the magnetite from the mountain pass carbonatite in California has a similarly low temperature peak near 550 C. The skarn magnetite from Lyon Nv. has 2 peaks, with decrepitation both lower and higher than 550 C.
The low intensity of decrepitation on the agrium calcite was surprising. Carbonates are usually a problem in decrepitation as they decrepitate intensely and small amounts of contamination in a quartz sample will swamp the quartz signature. Consequently, when analysing quartz with traces of carbonates present, the samples must be washed in acid to remove the carbonates first. The lack of decrepitation on the agrium calcite may be due to a very "dry" (low water content) of the carbonatite emplacement. However, this does not seem consistent with the intense decrepitation of the magnetites, implying a hydrothermal type emplacement. 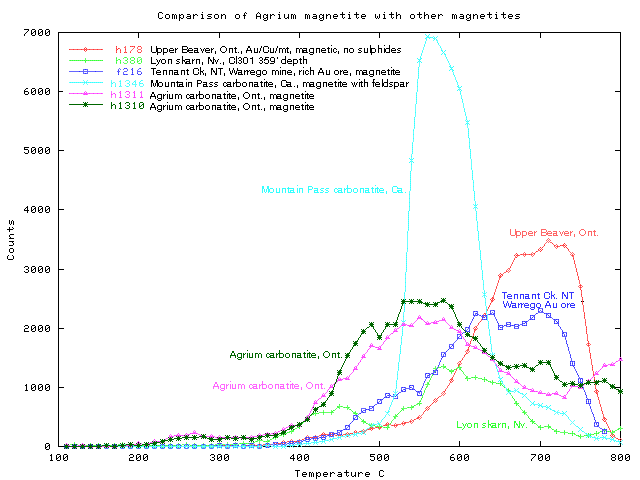 The magnetite samples at Agrium mine show intense decrepitation signatures similar to hydrothermal and skarn type magnetites from other deposits. Magnetite from the Mountain Pass, Ca, carbonatite shows a lower temperature peak on these 2 deposits than is occurs on most other magnetite samples. This is interesting, although more sampling is required for substantiation. The low intensity of decrepitation on calcite from Agrium is quite unusual. Perhaps this relates to the water content during emplacement. However, the lack of literature information on fluid inclusions in calcite limits an interpretation at present.